Team 1 from Teodoro Aguilar Mora Vocational High School won first place in the high school division. Student teams from Puerto Rico snagged the top prizes in NASA's 20th annual Great Moonbuggy Race, speeding over a rugged half-mile course that mimics the lunar surface. Six-hundred participating student drivers, engineers and pit crews descended on the U.S. Space & Rocket Center in Huntsville, Ala., for the two-day event on Apr. 26 and 27 hosted by NASA's Marshall Space Flight Center. 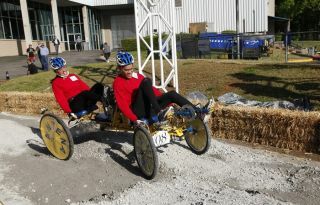 A total of 89 teams from the United States, Puerto Rico, Canada, India, Germany, Mexico and Russia took up the challenge to design, built and race lightweight, pedal-powered mock moonbuggies. The race is inspired by the real Lunar Roving Vehicles first driven by NASA astronauts during the Apollo 15, 16 and 17 missions that explored the moon between 1971 and 1972. "Traversing the grueling half-mile course, which simulates the cratered lunar surface, race teams face many of the same engineering challenges dealt with by Apollo-era lunar rover developers at the Marshall Center in the late 1960s," NASA officials explained in a statement. "The winning teams post the fastest vehicle assembly and race times in their divisions, with the fewest on-course penalties." Team 1 from Teodoro Aguilar Mora Vocational High School of Yabucoa, Puerto Rico took 1st place in the high school division, making it through the course in 3 minutes and 24 seconds. For the college division, the top prize went to students from the University of Puerto Rico at Humacao who crossed the finish line in 3 minutes and 32 seconds. In addition to their trophies, the first-place teams were each awarded a $3,000 cash prize from sponsor Lockheed Martin Corp, NASA officials said in a statement. The moonbuggy race has been growing since it began in 1994 with just eight college teams. A high school division was added in 1996.